Lori is a caring woman, and Johnny's biggest support. She's the force that gives him strength whenever he feels down and about to give up. A loyal friend, a committed wife and a nurturing mother, she won't hesitate to fight if her family is in danger. She loves her husband madly, and enjoys pleasing him in every way she can think of. She wants to have a big family, something that Johnny has decided to grant her to some extent. She comes from another dimension, supposedly 2000 years ago. She is a bit wild (in a nature way). When she met Johnny, she got completely head over heels for him, and finally achieved what it was thought impossible: to return with him as his wife. - Twin boys: Toni and Dani. 4 years old. -Twin girls: Nuri and Keri. 1 year old. She's a druid, so she controls nature's magic. She masters the invocation of plants, and Johnny has taught her a few other things. She's medium build, with a curvy silhouette and breasts cup C (all natural). She's got firm muscles, but she's not ripped. Her fur coat is orange-yellowish on his back, arms, legs and tail. Her belly, inner thighs and muzzle is whiteish. She has rosettes all over his yellow coat, and in her inner thighs and upper breast. She wears robes when around people, but prefers to wear none around Johnny. He doesn't mind. -A collar with a paw medallion, to transform herself in animals. -A ring in her left ring finger. She won't take off these accessories even when naked because they're gifts from Johnny, and they mean a lot to her. She would only take them off if they're roleplaying, just to keep herself in-character. 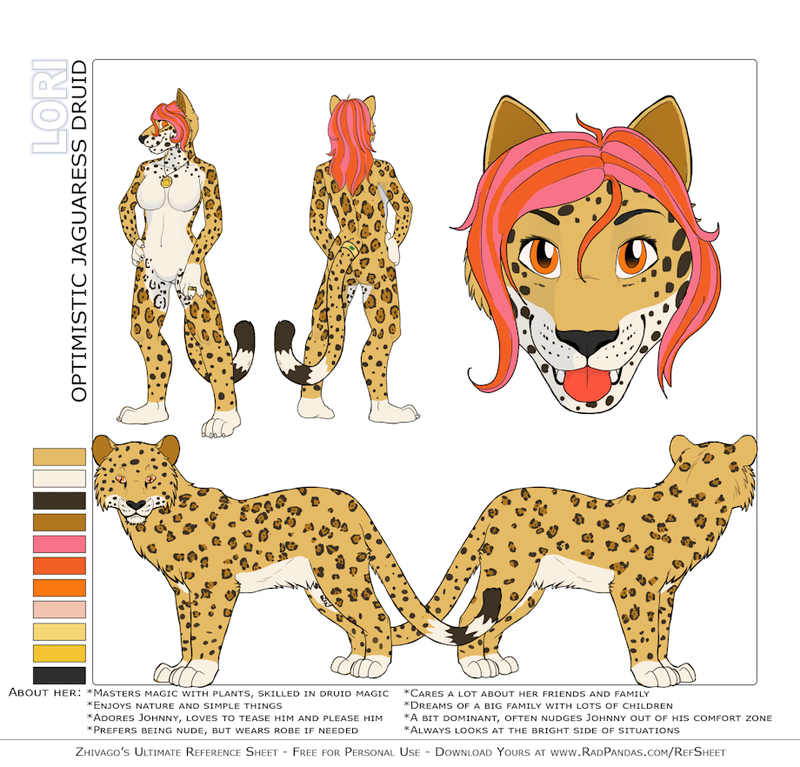 2016 Ref sheet for Lori. Ref sheet base done by Zhivagod, modified by me.